While the town itself is quite small, and offers little in the way of excitement, the entire zone is very large, and will take some time to explore. Your mission here is to find the second password for the Rocket Warehouse. There are five main sections in Six Island. Heading East from the town will lead you to the Water Path. This zone connects the town to all the other zones of Six Island. Walking south will lead you to the Ruin Valley zone. Heading north by Surf will eventually lead you to the Green Path zone. One of the houses in the north part of this zone holds a girl that will measure the horn of a caught Heracross. As a reward, the girl will award you a Nest Ball. Sentret, is a Normal Pokemon well known to veterans of the Gold/Silver series, as it was probably the first Pokemon captured by them. Its moveset is filled with Normal moves, and so it will benefit from the STAB advantage. Once it evolves into Furret, it acquires decent and balanced stats. Despite this, Furret brings nothing too exciting to the table, and there are better Normal Pokemon to pick from such as Snorlax, that carry far better stats and moves. Qwilfish, exclusive to Fire Red, is a Water/Poison Pokemon with strong attack and speed stats. Qwilfish's learnset is not very varied, but will eventually learn Take Down and Hydro Pump. Qwilfish's stats are decent, but there are much better Water/Poison Pokemon out there, such as Tentacruel, so it may not be worth adding to a team. Remoraid, exclusive to Leaf Green, is a Water Pokemon with a lot of potential. Its learnset includes powerful moves such as Aurora Beam, and once it evolves into Octillery, it will also learn Octazooka, an exclusive move to it, and even Hyper Beam!! Its stats are good all around, and enjoys especially high attack and Spc. Atk. stats. It can be a great addition to your team if you wish to change your current Water Pokemon. Dragon Scale: From the grassy area, Surf south and reach a small sliver of land. Oran Berry (hidden): East of the Green Path entrance. Nest Ball: Present a Heracross to girl inside one of the houses. 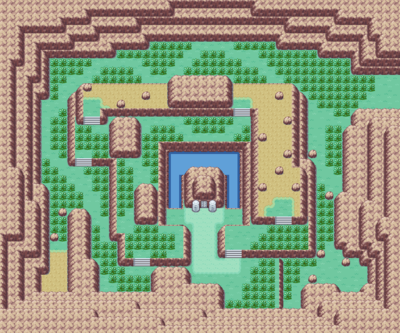 Ruin Valley is a zone filled with trainers that are attempting to reach the ruins in the center. To reach the ruins, travel in a spiral pattern until reaching the entrance. Don't forget to pick the items on the floor though! Once you reach the cave, the Braile puzzle will hint at what you need: Cut! Bring a Pokemon that knows it and use it on the door to access the Dotted Cave! Within Dotted Hole there are no battles, only a puzzle. To make it simple, head down the hole, then keep falling into holes in this pattern: Up, Left, Right, Down. After this, you'll arrive to a room with the Sapphire! Unfortunately, a stranger has followed you and steals your gem. At least he reveals the next password to you: "Yes, nah, Chansey". 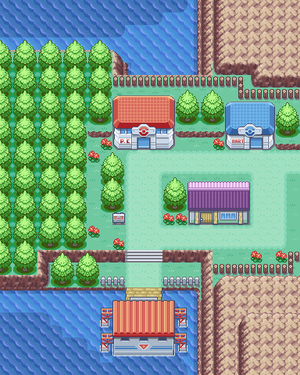 You can now go to Five Island and confront Team Rocket, but you should nevertheless stick around Six Island for a while, as there are many more zones to explore! The tiny bird Natu, brings yet another strange combination of types to the table. As a Psychic/Flying Pokemon, it can fill a number of places in your team. Its stats, once it evolves into Xatu at level 25, are well balanced and sporting strong Spc. Atk. and Speed stats. Xatu's weakness, though, is its learnset. Xatu's moves are quite limited and unreliable. Xatu will only learn the powerful Psychic at the very high level of 65. Xatu is a good choice to place into your team given its stats, but to be effective you'll have to spend some TM's on it. Yanma is a Flying/Bug Pokemon that looks quite impressive. Unfortunately, looks are all it has going for it. Yanma carries low stats all around, coupled with a learn set that is lacking in offensive moves, its strongest being Wing Attack at level 39. Yanma cannot even learn Fly. Yanma is unable to evolve in this Generation, and so its situation will not change in this game. Leave Yanma in your PC. If there is a Pokemon that defines stalling, it's Wobbuffet. Wobbuffet's moveset is limited to four moves: Counter, Mirror Coat, Safeguard and Destiny Bond. It learns no more moves, either by leveling or by TM. Its moves make Wobbuffet a nightmare to fight in competitive battling. Coupled with is immense HP, it can bounce back the opponent's moves, be immune to status afflictions, and offer a certain KO. If you are looking for a wall, look no further than Wobbuffet. If you travel west from the Water Path, you will arrive to the Green Path, a small area containing the Pattern Bush sub-area. The small island hides an Ultra Ball. If you surfing north from this area, you will encounter Outcast Island. 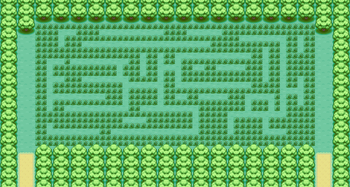 The Pattern Bush is a forested area, consisting of a patterned area of grass, a lot of Bug Pokémon, and some trainers. You will need to go to the southwest corner of the place to get out. Expect to find some new Pokemon here! Spinarak is the first of the new Bug Pokemon available here at Pattern Bush. Yet another Bug/Poison type, Spinarak, when evolved into Ariados, acquires decent stats all around. Unfortunately, its learnset leaves much to be desired about. None of its moves are capable of inflicting heavy damage, until it learns Psychic at a disastrous Level 63. Catch this Pokemon to fill your Pokedex, but leave it out of your team. Ledyba, is yet another Bug/Flying Pokemon encountered solely at the Sevii Islands. Sporting surprisingly good Spc. Def. and speed stats, once evolved into Ledian, this Pokemon nevertheless lacks a good learnset, with no moves enjoying the STAB advantage. Its strongest move, Double Edge will only be learned at level 60, and with such a bad attack stat, it's not worth it anyway. Ledian can perhaps serve as a decent wall, but there are other Pokemon out there that can serve that purpose much more efficiently. Leave this Pokemon in your PC. Heracross, the last of the three new Bug Pokemon available at Pattern Bush, it is the best of them by a long shot. Its types are Bug/Fighting, an unusual combination that works quite well. Bug Pokemon are not widely used due to usually being cursed with pitiful stats. This is not the case for Heracross. It is blessed with great stats all around, and its attack stats are especially high. Its moveset is somewhat lacking, but it will eventually learn the awesome Megahorn at Level 53. Heracross is easily the strongest Bug Pokemon in the game, and one of the best Fighting as well. If you are looking for a heavy hitter, look no further than Heracross. By surfing north from Green Path, you'll arrive to this zone. You will encounter some trainers, and at the end, you'll reach a cave with a Rocket Grunt standing outside. If you enter, you will find yourself at the Altering Cave. You will find no trainers or items inside, and the only Pokémon to be found within are Zubat. Technically, the wild Pokémon to be caught were supposed to change if Mystery Gift were used at a Nintendo Event, but this never took place within the US. This page was last edited on 2 July 2017, at 00:27. This page has been accessed 253,847 times.